The main purpose is to provide an understanding of the basic concepts in biochemistry and biotechnology which are required for them in a simple and interesting manner. 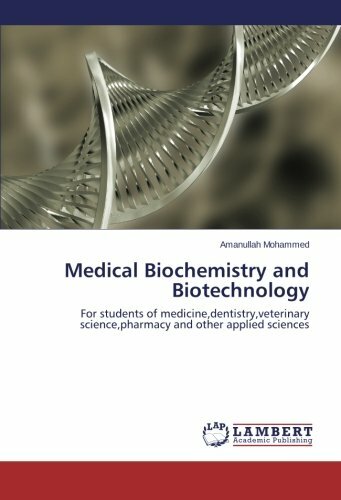 This book has been prepared for students of undergraduate courses in medicine, dentistry, pharmacy, laboratory medicine, physiotherapy, veterinary science, agriculture, biochemistry, genetics, microbiology, biotechnology, molecular biology, etc. This collection of Wikipedia articles is intended to supplement a standard textbook of biochemistry. Students may find its explanations complement their texts for greater clarity. In some areas its information will extend past their texts. This book covers material of a course in bioinorganic chemistry for graduate and advanced undergraduate students in chemistry or biochemistry. It should provide students with the background required to follow the research literature in the field. This is a short and easy-to-read biochemistry book: proteins as the body's worker molecules, X-ray crystallography, NMR: magnets and radio waves, structure-based drug design: from the computer to the clinic, beyond drug design.